We had a really good day on Thursday with sunshine all morning but a bit cloudier in the afternoon. The wind started off a fresh W.S.W. but tended to back during the day but we managed OK. We had 17 members on site at the briefing and several more came soon after. All the doughnuts went in a flash. We started off outside the clubhouse but after a couple of launches realised it would soon be making ruts so we moved to the stub on the south side and flew from there for the rest of the morning without problem. 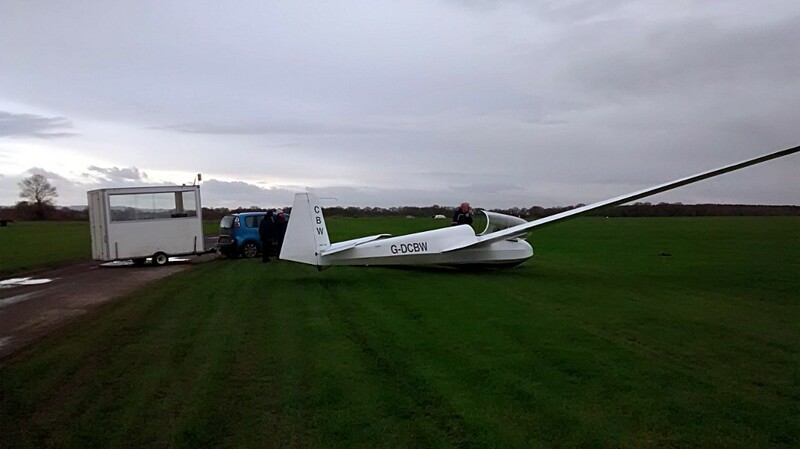 By lunch time it seemed everyone had flown and had disappeared back to the clubhouse and so we were going to call it a day and hangar landed both of the 13’s. However one member decided to have another flight as we were about to return the second 13 to the hangar. We launched from half way along the peri-track and they gained an extra 200ft on the launch compared to the morning. This seemed a good idea and so several more chose to do the same and kept us flying for another couple of hours. The good news is the new launch point trailer worked very well even from maximum distance from the winch. K13 G-DCBW at the unusual one-nine launchpoint. Many thanks to Tony P and Andy S for persevering to find places for us to launch and land, meaning we had a good and long days flying. Longest Flights………………9 mins from the short morning run. 11 mins from the longer afternoon run. Total Flight Time…………….2 hrs. 24 min.